Cleaning your shower/ tub might be one of the least fun things you can think of. There’s just so much to wipe down and so little space for your body when you’re trying to scrub away. We’ve spent years working on the perfect way to get the tub sparkling so get ready to take notes, we’ve got a few tips for you that’s about to make the cleaning a whole lot easier. Spray down all the walls with your cleaning solution, then start scrubbing on the wall opposite of the shower head. We recommend circular motions, going top to bottom with your tile brush. Keep rotating around until you’ve scrubbed all the walls. 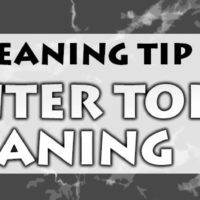 Give the tub a thorough spraying with your cleaning solution and sprinkle a generous amount of baking soda in to the bottom, this is what’s really going to get the grim off the bottom of the tub. Once again, go in circular motions with your tile brush until you’ve worked most of the baking soda in. Fill up your rinse cup with the faucet and start on your first wall. We usually press the top of the cup right against the wall then drag it across letting the water run down the wall as it washes off the cleaner. Be sure to rinse out the bottom of the tub too. Pull out the squeegee and run it along the walls, this will really cut down your dry time and help prevent water spots. After you’ve squeegeed whip out your drying towel. We’ll usually have two on hand so that we can stand on one in the shower in order to not leave footprints. Dry off your walls and the bottom of your tub. BOOM you’re done! That wasn’t so bad, especially since you had a plan. We hope these tips were helpful in conquering the dirty shower dilemma, but if it’s something you NEVER want to do again think about hiring Maid to Shine the next time you need a good clean. I love those comments keep em coming they are very helpful for a newbe like me thanks for sharing appreciated. I’ve never had much success when it comes to getting my shower tiles looking brand new and sparkly, however, I hired a tile cleaning company in Spring, TX and the results were AMAZING. I didn’t actually know my tile and grout could look so good. We’ll definitely be trusting in our professional tile cleaners from now on. People think that cleaning the shower is easy but you have to get inside, get wet (sometimes) and clean it. Awesome, I’m going to try this, this weekend! I have the hardest time cleaning my shower, tile and grout usually and have been trusting in a Spring tile & grout cleaning for the last few years. Each time they visit my bathroom looks sparkly and new, it is wonderful for when people are visiting for the holidays. Really hope this is as effective though! very nice blog. thanks for these five useful tips. You can add vinegar to the cleaning solutions. It works wonders in the shower and bathroom. Thanks for the tip about staring your shower cleaning on the wall opposite the shower head. It makes it so much easier to rinse the walls off when you’re finished and give me a place to focus when I start my bathroom cleaning. I’ll definitely keep using these shower cleaning tips. Thank you for these five tips. The baking soda one was extremely helpful when I tried it and it saved me time from having to scrub so hard on the service of my bath tub.